After the mudpots and hot springs of West Thumb Geyser Basin, the Grand Loop road winds northwards around the west shore of Yellowstone Lake, always staying close to the water, past many overlooks, picnic spots, and two trailheads; one for the short path along Bridge Creek to a rhyolite natural bridge, the other for a loop hike up steep-sided Elephant Back Mountain. The Bridge Creek hike begins at Bridge Bay, site of one of the two marinas on the lake, plus a ranger station and 420 site campground, the largest in Yellowstone National Park. Two miles north of here, Lake Village has a hotel, another ranger station, a post office, a visitor center and more day hikes. The road forks just after the village; the left branch leads to the popular Canyon area while the right fork crosses the Yellowstone River over the historic Fishing Bridge, follows the north shore for a while then turns away from the lake towards the East Entrance of the national park. This highway traverses wooded mountainous country with three places of note: Avalanche Peak, summit of which is reached by a strenuous 2.5 mile trail and provides an excellent viewpoint, 8,537 foot Sylvan Pass, the high point of the road, and Middle Creek - a sizeable drainage that runs down a dramatic, steep-sided ravine. After exiting Yellowstone, the road continues to descend along the larger valley of the Shoshone River, passing many national forest campsites but few other facilities until Cody, 50 miles after the park entrance. 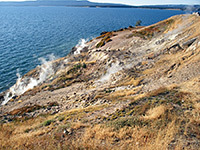 The 8 mile stretch of the highway along the edge of Yellowstone Lake is very scenic, and besides various trails and overlooks, also passes a few thermal areas, including Steamboat Springs, a number of fiercely steaming vents right on the shoreline, at Steamboat Point. From Fishing Bridge the left fork of the Grand Loop Road runs northwards beside the Yellowstone River into Hayden Valley, but first passes through an interesting thermal region - a relatively small but very active area characterized by mud and sulphur, and containing a variety of mudpots, fumaroles, sulphurous springs and odorous pools. 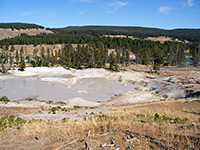 The Mud Volcano Group, on the west side of the road, has a one mile loop trail that encounters features like Dragons Mouth Spring, a small flooded cave were gas noisily pushes aside the water at regular intervals, Mud Geyser, a simmering lake of grey-brown water, and Mud Volcano itself, another fermenting muddy pool. These three are quite close to the road, but it is well worth walking the full loop to see other features higher up the hillside, in more wooded ground, including three more sizeable pools: Black Dragons Cauldron, Sour Lake and Churning Cauldron, this latter the most active of the whole group (see video). There are more springs and vents east of the road, on both sides of the river - a particularly sulphurous, acidic region that is too dangerous for trails but can be seen from several viewpoints beside the road. 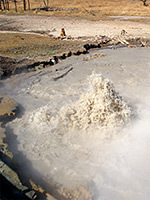 The centerpiece is Sulphur Cauldron, a large, yellowish pool that constantly bubbles and fizzes, and is next to another big, muddy spring (Turbulent Pool). This whole region has been quite variable in activity, and was much more violent when first discovered in 1872 with Mud Volcano at that time a 30 foot high conical vent flinging mud high into the air, but has declined since then though in 1978 and 1995 two new areas of hot pools and fumaroles were formed, on hillsides near the Yellowstone River. North of Mud Volcano, the low hills to the west fall away and the river enters the wide open grasslands and marshes of Hayden Valley, which together with Lamar Valley to the northeast is one of the two best locations for roadside wildlife viewing in Yellowstone, and often traffic is disrupted by visitors stopping in mid carriageway to photograph the bison that graze here. 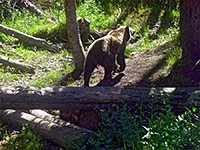 Bears are much less common but both grizzly and black bears may be seen in the distance, in the upper reaches of the valley to the west. Elk and coyotes are also commonly spotted. The Lamar Valley is much the better place to look for wildlife, however, as there is less traffic, and the road follows the grassland for many miles, rather than Hayden Valley where the highway crosses it only for a short distance. There are more sulphurous springs and vents, and one geyser, in the Crater Hills towards the north side of Hayden Valley though these are one mile from the road and not signposted. 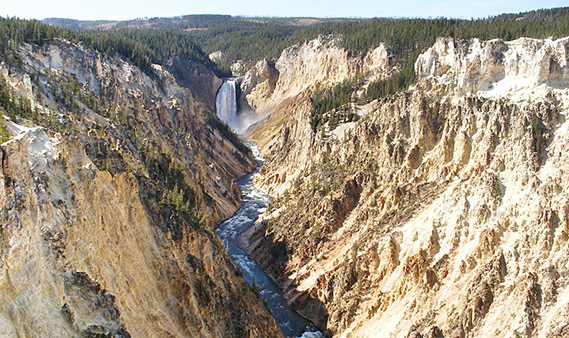 After the flat lands of Hayden Valley, hills rise up either side of the Yellowstone River, which flows over two large waterfalls and drops into the Grand Canyon of the Yellowstone, one of the most spectacular canyons anywhere in America. Its walls are very steep - 700 feet almost vertical at the western end and up to 1,200 feet further east, and partially formed of jagged, eroded, chemically altered volcanic rocks of unusually bright colors - red, pink, orange and white. Most of the 20 miles of the Grand Canyon are out of sight since the surrounding land is too rough for roads or trails, but the upper 4 miles can be viewed from several overlooks along the north and south rims, and a number of trails. 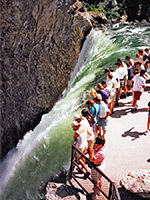 In the north, the main road curves round 109 foot Upper Yellowstone Falls, then a side road follows the canyon edge, first to Lower Falls Overlook, where a short trail descends to a fenced viewing area right beside the lower falls as they drop down 308 feet into the depths of the canyon. Next are Lookout Point and Grandview Point, then possibly the best viewpoint of all is Inspiration Point, a small promontory projecting south into the canyon that allows great views directly up and down the river. Near here begins the 5.5 mile trail to Seven Mile Hole, perhaps the best hike in Yellowstone National Park. The side road is a one-way loop drive, starting at a major junction in the Grand Loop Road at Canyon Village; the left branch heads west across the Solfatara Plateau to Norris Geyser Basin and the west national park entrance, while the northern fork climbs over 8,873 foot Dunraven Pass beside Mount Washburn, then continues to the Tower and Mammoth areas. Also at the junction is a visitor center, campground, lodge and other tourist facilities. The three mile South Rim Drive passes another overlook of the lower falls, and a steep path down to a viewpoint near their base. Named Uncle Tom's Trail after its creator Tom Richardson (in 1898), this descends 500 feet by means of steps and elevated metal walkways, making for quite a strenuous return climb. The drive ends with more classic views at Artist Point, especially upstream, where the image of the whitewater river flowing over the lower falls and through the Grand Canyon is one of the most photographed in the national park (see 360 degree panorama). 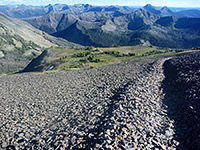 A three mile trail leads from roads end further east along the rim, ending at Point Sublime, while other trails run alongside both rims of the canyon, and to various lakes in the backcountry to the south.